Straight single action aluminum trigger with pre-and over-travel adjustment. 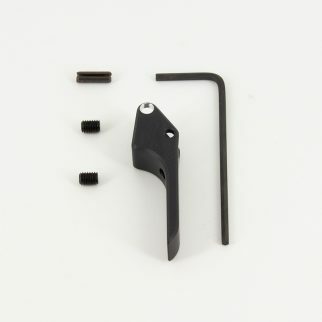 All Cajun Gun Works supplied triggers include a 1.5mm allen wrench for your convenience. This trigger is now a Cajun Gun Works product proudly “Made in the USA”! TECH TIP: This is a “conversion” trigger and completely disables the double action feature. When installing this trigger you will need our TR-PIN as a replacement for the throw away CZ OEM trigger pin, and our SP starter punch for removing the CZ OEM trigger pin. Remove the disconnector when installing this trigger. This trigger cannot be used in any CZ decocker.